The Vermont Workers’ Center is a member-run grassroots group dedicated to organizing for workers’ rights and livable wages for all Vermonters. One of the organization’s major initiatives is “Healthcare Is a Human Right.” The campaign’s stated intention is to provide all Vermonters with a model health care system, in order to show the rest of the United States that such a system can be successful. To help support this effort, Brattleboro blues guitar ace and humanitarian Scott Ainslie has enlisted an impressive lineup of musicians for a benefit CD entitled Care for All: Musicians for Healthcare. “Scratch It While You Can” is a sparkly instrumental by Connecticut Valley bluesman Chris Kleeman, from his album Northern Blue. Kristina Stykos delivers “Let’s Cherish the Day,” a dreamy new song from the Chelsea guitarist and songwriter’s forthcoming solo effort, Raven. The song is followed by “Wedding Day,” a pensive cello piece performed by Eugene Friesen. Ainsle himself delivers an incredibly soulful rendition of Stephen Foster’s “Hard Times Come Again No More,” just before Anaïs Mitchell gives us the grand finale, “Suffering of the People.” The latter song is a dance track featuring the Central Vermont People’s Chorus, late Montpelier electro-reggae outfit Maddub and, perhaps most interestingly, a selection of comments about socialized health care by Senator Bernie Sanders — the distinguished gentleman’s first foray into recorded music since a long out-of-print 1987 cassette produced by Todd Lockwood entitled We Shall Overcome. There’s not a dull musical moment on Care for All, and Ainslie’s eloquent liner notes tie it all together beautifully. I was moved and inspired by the music and the message. It’s exciting to see Vermont musicians giving it up for a good cause. 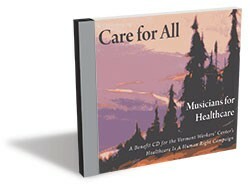 Care for All: Musicians for Healthcare is available at VermontCareForAll.org.